When we think of a massage, our minds automatically associate it with a luxurious and self-indulgent activity that relieves our tension and stress. However, massage is much more than that: it’s also a therapy, holistic treatment, and healing technique. By definition, according to Northwestern Health Sciences University, massage is the “manual manipulation” of soft tissues, such as tendons and muscles, to relieve pain and stress, as well as promote a person’s overall psychological and physical well-being. It implements specific techniques like kneading muscles with knuckles and hands which will specifically encourage healing, relaxation, and restoration. Massage is separated into two categories: rehabilitative massage and relaxation massage. Rehabilitative massage is widely used for medical purposes, such as acting as a complement to physical therapy; it focuses on targeting deep tissue and physical ailments. Relaxation massage, on the hand, is the type of massage we’re most familiar with since it’s offered at spas and resorts; in other words, the “treat yourself” luxury. Under these two categories is a diversity of massage types: Swedish, Deep Tissue, Sports, Trigger Point, Hot Stone, Shiatsu, and Reflexology - just to name a few. 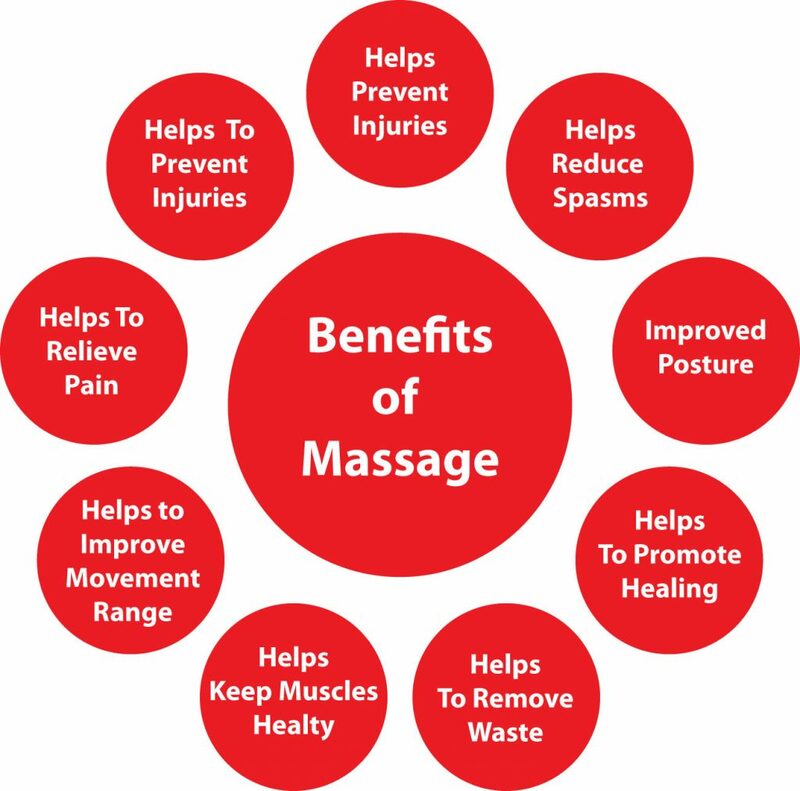 Each serves a designated purpose and caters to a specific need of the massage recipient. For example, athletes tend to opt for Deep Tissue, and Sports massages since these types of massages utilize heavy pressure intensity which will release tension, improve performance, reduce the risk of suffering injury, and stabilize nerves. Individuals who seek gentler massages such as a Swedish or Hot Stone will have a more relaxing massage experience to simply melt their stress and tension away. Aside from being an activity that helps you unwind from a long day, massage has proven to be incredibly beneficial for the health of both the mind and body. According to a survey, more than 59% of healthcare providers and doctors recommended the implementation of massage therapy to improve overall health and assist in treating present conditions. Evidently, massage has become a credible source of health benefits in the eyes of the medical community. On average, an hour-long massage reduces cortisol by 30% and increases serotonin by 28%. For individuals diagnosed with depression and anxiety, their symptoms of low mood and fatigue are thoroughly alleviated thanks to it since serotonin is the body’s natural chemical that lowers the pain response and cultivates emotional balance. Furthermore, massage has been shown to be a reliable form of addiction treatment. Since massage decreases stress, it also enables a recovering addict to combat the impulsive, emotional triggers they will inevitably face during their journey to sobriety. Massage, however, should not be seen as the ultimate treatment for mental illnesses and conditions, but rather a positive complement to already prescribed treatments such as psychiatry, therapy, and medication. From sprained ligaments, broken bones, and even burns - massage has been proven to speed up the general recovery process. A Deep Tissue massage on a sprained ankle flushes out built-up lactic acid and metabolic waste from the area of injury, thus allowing for more ample blood flow, oxygen, and nutrients to heal it. On a broken bone, massage improves mobility, reduces the discomfort of stiffness, and even restores energy and movement. Lastly, a study from the Korean Journal of Hepatology found that individuals who have suffered burns reported having less depressive episodes and itching after three months of routine massage therapy. What’s more, in comparison to those who did not use massage, they also saw significant and faster healing in their skin condition. According to a study from the Touch Research Institute, people with arthritis who receive massages on their wrists reported they immediately experienced less joint pain and actually developed better grip strength. What’s more, they began to have a lower number of anxious and depressive episodes. In addition, another study at the institute, along with the University Miami School of Medicine and Iris Burman of Miami’s Educating Hands School of Massage, found that their subjects who had chronic back pain reported that their condition became easier to endure over an extended period of time because of massage therapy. Ultimately, in these cases, massage acts a type of pain management to chronic physical conditions. As mentioned before, massage triggers the production of serotonin to prevent symptoms of depression and anxiety. But serotonin is not limited to improving one’s mood - it’s actually an essential hormone that enables us to fall and stay asleep! Serotonin is converted into melatonin in the brain, which is responsible for restoring our body’s circadian rhythm and preparing it for sleep. Now, since insomnia impacts one’s physical health and neurological functions, medication has become a popularized form of treatment. However, a majority of insomnia medications are addictive and harmful. Thankfully, massage therapy acts as a holistic approach to insomnia and sleep problems, which guarantees the mind or body won’t suffer any consequences in the long run. Massage relieves the tension that builds up in one’s head, neck, and shoulders - the common areas affected by headaches and migraines, as well as aide in rehabilitating bone misalignment, soothing eyestrain, and diminishing chronic emotional and physical stress. It reinforces blood flow which will reduce the intensity and frequency of experiencing headaches and migraines, thus helping one perceive less of a pain response. It’s important to note that not all massages will benefit you. Take the time to reflect on your personal needs and circumstances that can be improved - such as your stress levels or back tension as a result of poor posture - in order to find the massage that’s right for you. Furthermore, massage therapists are thoroughly educated in both the art of massage, as well as its scientific and medical aspects. Therefore, you don’t need to worry that a massage therapist will just offhandedly knead and rub your muscles. There are educated and trained to treat your body in a certain way that will elicit the emotional and physical responses that help you feel healthier, less stressed, and happier. To reiterate, massage is beneficial for a diversity of reasons and can only positively impact your life. Because massage is primarily used to treat specific mental and physical conditions, as well as soothe stress and help you relax, see it as a form of self-care, rather than a luxury. You don’t need to have a specific condition to reap the benefits that come with a massage at all!